Book on to our monthly pass. This gives you the freedom to attend up to 12 of any of our classes within the full calendar month , a massive saving and huge flexibility. You must let us know which classes you will be attending. Great motivation to get more training, see more parks, discover new trails and meet new people and dogs . Lindsay has been involved in Sled dog sports for 9 years (where she met Mr Cani-Fit). Struggling to find a training club that would allow her to train with her dog to get race fit, she decided to set up her own. 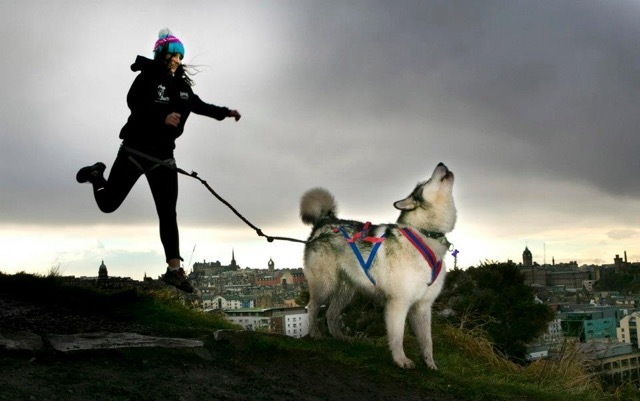 With the help of a couple of canicrossers locally Cani Sports Scotland found its feet. Spending more time training, racing, learning, mushing in Canada, training others - than actually working she soon realised it was time to take the plunge and offer a service no one else was offering - fitness training for the human and dog! And so Cani-Fit was born in 2011. Accomplishing canicrossing 96 miles of the West Highland Way, winning several national championships and taking podium in 95% of races she has attended, it is safe to say her own Cani-Fit experience has gone from strength to strength. She has Suko to thank for a lot. He has been the ultimate teacher, mentor , training partner and pal! "Now we have Mini-Fit (Evan), I cannot wait to see what the future has to bring”. Just Dae it!